Lucy Neatby posted to my Facebook wall that she was off to teach a class on 3 scarves - Sea Lettuce, Falling Leaves and Mirror, Mirror and her comment was.."a nice knitting cocktail!..." Lucy is an amazing designer. She may even be considered a knitting acrobat. What she does with the simplest of stitches is pure entertainment. Here is sea lettuce. It is a ruffled scarf based on the short row technique. The other two scarves are just as exciting. The idea of mixing "things" up into a cocktail got me thinking about a number of patterns that could really create a buzz with the right ingredients. Use-up leftover yarn patterns do not have to be relegated to the scrap bin and look like leftovers, when they are finished! 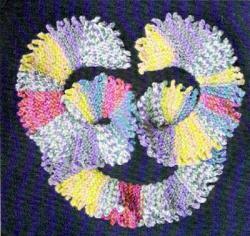 Here is a link to my website where I have grouped a number of these patterns. At first glance they don't really look like anything; but with a little imagination you could really make them POP! Use these suggestions for the patterns and they will be stunning. 1. 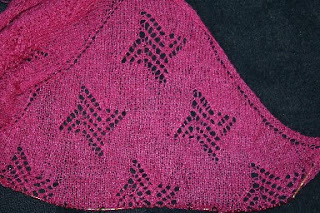 Work any pattern in just one colour and all the same shade; but use yarns of different textures. Give a little thought to the arrangement of the spacing of the different yarns and you'll create a masterpiece. 2. Use one colour again but in different shades and maybe different textures. The trick here is to make sure that the shades are very compatible. 3. Use different colours and again maybe different textures; but limit yourself to 3 colours. 4. Use the same colour; but add beads to some areas and not others. Use beads of the same colour or a complementary colour. 5. Use different colours (3) or different shades and use beads or embroidery mixing up the placement of beads of one colour on backgrounds of another colour - are you still with me? Here is another link to a designer that really pushes the limits with mixing, matching, shape and design - Colleen Davis. Although Colleen is strong on creativity, the actual presentation of the patterns needs some work. "Everything" is there, you just have to do a bit of leg work; but you will get an amazing garment! So, will these cocktails be "shaken" or "stirred." Well, James Bond's martinis were always "shaken"; but I like the idea of stirring up a little magic with those needles. Speaking of stirring, my lace pinwheels are coming along. I'm maybe not moving as fast as a Sagittarian - I am a fixed sign - but I do have other work to do as well - not least among them is responding to those facebook comments. Dinner to-night? How about Penne al la Vodka - I like this recipe because it gives you an alternative to using cream. OK, you don't have to use the Vodka either; but you can still enjoy!! !